What Is a Military Nurse? Military nurses are licensed registered nurses who are contracted to provide medical care specifically to patients in military clinics and hospitals. Much like traditional registered nurses who treat civilians, military nurses monitor wounds for infection, prepare patients for surgical procedures, and administer preoperative and postoperative care for those inside the military. Not only will military nurses have the chance to travel and see the world, but they also have access to excellent education and are compensated for time spent studying. They also enjoy excellent benefits, such as free healthcare. Additionally, job responsibilities for military nurses include monitoring the pain and comfort levels of patients, assisting the disabled to care for themselves, and providing psychological and emotional support. During peacetime, military nurses will most often care for active-duty military personnel, military retirees, and their dependents. In some instances, they might even provide healthcare to civilian emergency patients. Conversely, during wartime, military nurses provide medical care in and around conflict zones and near battle fronts. A military nursing career can be an immensely stressful, and often heartbreaking job. Furthermore, it can also be dangerous, since it isn't unusual for military nurses to be deployed to foreign war zones along with active troops. To become a military nurse, you must first be a U.S. citizen. There are some personality traits that an individual should have if they're going to be competent military nurses. Effective military nurses should be in excellent physical shape and must be able to think clearly under stress so as to make life-saving decisions quickly. Additionally, military nurses should have competent communication skills, be able to adapt to change quickly, and have high stamina and endurance. Military nurses need to be able to work efficiently with little sleep. What Are the Educational Requirements for a Military Nurse? The first step in becoming a military nurse is obtaining your Bachelor's of Science in Nursing, also known as a BSN degree. Typically, BSN degrees take around four years to complete. Although the military prefers their nurses to have BSN degrees, the Army Reserve accepts nurses with only Associate's Degrees in Nursing, or ADN degrees. However, these RNs are expected to have a BSN degree by the time they're ready for promotion as Captain. Once you have obtained your bachelor's degree in nursing, you are then permitted to sit for the state board examinations. Once a civilian RN has undergone the primary educational processes involved in becoming a military nurse, they will then also need to undergo officer training through whichever branch of the armed forces they wish to serve in. Officer training educates newly admitted RNs on leadership skills and military life. Additionally, during officer training, RNs are also required to show their proficiency in various physical fitness exercises. Before an individual becomes an official military nurse, they must already have graduated from a nursing program approved by their state's Board of Nursing and have taken and passed the National Council Licensure Exam (NCLEX-RN). Once you have passed your state board examination, you are eligible to obtain an RN license. After this, RNs can apply to a particular branch of the military, and if accepted, sign the necessary contracts and be sworn in. Read our Guide to Military Nursing Education & Service - Click the Banner! Where Do Military Nurses Work? Military nurses are required to make at least a three-year commitment to serve their country. Traditionally, military nurses are stationed in a new region about every three years. There may be required travel just about anywhere abroad to help with emergency situations if they do happen to arise. Most nurses in the military are stationed at military/government facilities. Some, however, will serve in makeshift facilities as they near the front lines with combat units. What Does a Military Nurse Do? Being a military nurse gives a person a unique chance to help others while serving their nation's people at the same time. However, it's not a career path for everyone. Both psychological and physical demands, along with the extensive travel required, can make being a military nurse a challenging career. Nurses in the military often work in high-stress and fast-paced environments in situations that are physically dangerous and even life threatening. Due to the kinds of working conditions military nurses are often subjected to, they have the opportunity to develop top-notch nursing skills that may translate to further career advancement. As a military nurse, you'll be able to specialize in psychiatry, pediatrics, and trauma. Some other specialties military nurses work in are critical care, midwifery, emergency, and neonatal nursing. What Are the Roles and Duties of Military Nurses? Military nurses receive competitive wages and benefits, and most importantly, have the opportunity to build crucial skills and receive specialized training. The job outlook for military nurses is particularly good. The grade or rank that a military nurse holds will determine the pay rate for which they are compensated. Many aren't aware of the fact that enlisted registered nurses in the military have opportunities to have their student loans repaid by government programs. Over the next ten years, the military nursing field is expected to grow seven percent-higher than average for job growth in other professions across the country. 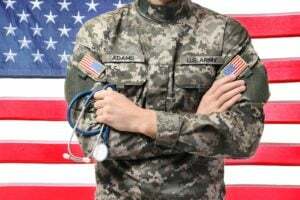 According to payscale.com and an estimate based upon a sample of 53 U.S. Army RN salaries, the average U.S. Army registered nurse earns $73,347, with a range of $58,000-$103,339 annually. Other benefits that military nurses receive are housing stipends, low-cost or free health insurance, hazard pay when assigned to combat zones, and retirement plans. They receive 30 days of vacation per year, and they can retire after 20 years of service and receive a pension.